When Israel enacted a new policy last month banning entry by advocates pushing a global boycott and divestment campaign against it, some of the strongest criticism came from a group that touts itself as pro-Israel. The policy, says J Street U, is "unhelpful and counterproductive." J Street U is the student wing of the lobbying group J Street, which claims to be pro-Israel but incessantly criticizes Israeli policy in the West Bank and other disputed territories. It's not just West Bank policy, former Israeli Ambassador Michael Oren argued. "It's all policies of all Israeli governments" making J Street "significantly out of the mainstream." The group says it opposes the global campaign to boycott, divest from, and sanction Israel (BDS), but when it comes to territory obtained during the 1967 war, all bets are off. And J Street U thinks Israel's travel ban is not the answer. "Tactics and messages that seek to censor, target and ban opponents of the settlement movement do not win Israel new friends on campus," a J Street U statement said. Instead, it is up to Israel "to end the occupation and live up to Israel's founding values of democracy, equality, and social justice. Ultimately, only a two-state peace agreement can bolster Israel's security and its international standing, marginalizing those who seek to isolate and delegitimize it." This recommendation ignores Israel's repeated offers to resolve the conflict that Arab states and Palestinian leaders rejected. And it overlooks the damage done to Palestinian workers who often depend on, and prefer, Israeli employers to support their families." Officially, "BDS aims to end international support for Israeli violations of international law by forcing companies, institutions and governments to change their policies." BDS supporters argue that, "As Israeli companies and institutions become isolated, Israel will find it more difficult to oppress Palestinians." But when BDS secures a victory, Palestinian workers and the Palestinian economy suffer. "There is no connection between the tactics and objectives of the BDS movement and the on-the-ground realities of the Middle East," says Palestinian human rights advocate Bassem Eid. "BDS spokespeople justify calling for boycotts that will result in increased economic hardships for the Palestinians by asserting that Palestinians are willing to suffer such deprivations in order to achieve their freedoms." A Forbes analysis by Carrie Sheffield reached the same conclusion. "The numbers speak for themselves," Sheffield writes. "Israel (Population 8.3 million) has GDP of $291 billion, the Palestinian Territories (population 4.1 million), $11.3 billion...In 2012, Palestinian sales to Israel accounted for about 81% of Palestinian exports and less than a percentage point of Israeli GDP." Boycotting Israeli goods, therefore, does minimal damage to Israel's gross domestic product but momentous harm to the Palestinian economy. In addition, "The BDS movement inflames rather than enlightens global dialogue around the peace process. Israel invests heavily in Palestine; the rest of the world doesn't bother," Sheffield writes. For example, SodaStream suffered major losses after it was forced to relocate from the West Bank town Mishor Adumim following intense targeting by BDS activists. More than 500 workers were laid-off when the plant closed its doors. That number included 74 Palestinians who lost their jobs because they could not obtain permits to work at the new location inside Israel. Palestinian workers react to losing their jobs when a BDS campaign forced their employer to relocate. 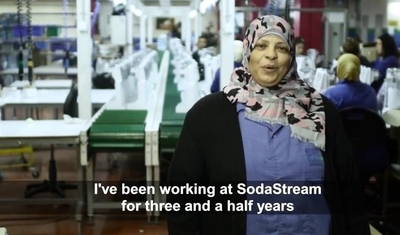 "All the people who wanted to close [SodaStream's West Bank Factory] are mistaken....They didn't take into consideration the families," said Ali Jafar, a Palestinian shift manager for SodaStream. The Palestinian BDS National Committee seemed intent on proving Jafar right, announcing its pride in forcing SodaStream to shut down the factory. BDS activists also spent seven years targeting the Dead Sea cosmetics company, Ahava, which in 2016 decided to relocate its plant from Mitzpeh Shalem, a West Bank settlement, to inside Israel's formal border. To truly shed light on the BDS movement's impact, it is crucial to call attention to the Palestinian Authority's praise of Israel's treatment of Palestinian workers in 2014. Given a choice between Israeli and Palestinian bosses, many Palestinians are quick to take jobs with Israelis, the PA's official daily, Al-Hayat Al-Jadida reported and Palestinian Media Watch spotlighted. "The only cases in which a Palestinian worker does not receive the salary his Israeli [employer] determined for him are those cases in which the middleman is Palestinian." "There are no job opportunities in the West Bank," Nahida Fares, a Palestinian woman employed by SodaStream, told The Times of Israel. "Even the jobs that do exist pay no more than NIS 1,500-2,000 ($430-570) a month." And what J Street U fails to mention in condemning Israel's response to the BDS economic extortion campaign are the numerous examples, dating back to the United Nations partition plan, in which Israel stood ready to accept a Palestinian state, only to have Palestinians say no. Immediately after 1967's Six Day War, Israel offered a land-for-peace process that would ultimately address the West Bank. Arab states rejected it. Former President Bill Clinton has detailed Yasser Arafat's 2000 failure to accept a peace deal that integrated 96 percent of the West Bank, including the Temple Mount, but PLO leader Yasser Arafat "never said yes." Instead, Arafat initiated the second Intifada, using his own forces to launch a series of attacks on Israeli civilians. Eight years later, Palestinian Authority President Mahmoud Abbas rejected another offer including nearly all of the West Bank with land swaps. But BDS and its J Street U supporters still think the responsibility should fall squarely on Israel alone. There is little to no pressure on Palestinians to end their incitement against Israel – in glorifying terrorists, and in demonizing Israel and encouraging violence. J Street stresses "that for the sake of Israel's future as a Jewish and democratic state, Israel needs to take steps to reach a negotiated two-state solution and end the occupation." But J Street also asserts that, "At the same time we recognize that many well-intentioned people have turned to BDS out of a deep sense of frustration with the conflict and the decades-long occupation." Israel's right to exist is not conditional. BDS efforts and victories have not and will not change Israel's policies. And when BDS efforts succeed, Palestinians unquestionably suffer.